Curaçao, like Aruba, is a desert island close to South America and offering a wide variety of beaches with surf ranging from placid to wild, sandy beaches and rocky cliffs, beach bars, and great diving and water sports. Here are some of the best of Curaçao's sandy strands (note that many beaches charge a small admission fee to visitors). The intimate Playa Kenepa (a.k.a. Klein Kenepa or Knip Beach) actually comprises two beaches: the larger Kenepa Grandi and smaller Kenepa Chiki. The beaches are partly shaded by manchineel trees and have a cliffside lookout point, which makes for a nice photo op. (Cliff jumping is also an option, but there is no lifeguard on duty, so you're on your own.) You can snorkel right off the beach and swim out to the reef. There are a snack bar and a tiny restroom on site. The view from above Playa Forti is right out of a postcard, with the fishing boats and a panorama of the island’s western tip. Here you’ll find a smooth-pebble beach lined with several snack bars. The Playa Forti Restaurant, which serves Creole food as well as burgers, is built on the ruins of an old English fort. The luxe Lodge Kura Hulanda Resort is nearby. Jan Thiel Beach is located in an upscale residential neighborhood east of the Curaçao capital of Willemstad. This beautiful open bay has excellent diving and snorkeling—it boasts a full-service dive operation—and has a kid-friendly wading area and a small water park. The African-themed Zanzibar Restaurant here rents beach chairs, serves three meals daily, and offers beachfront massage services. 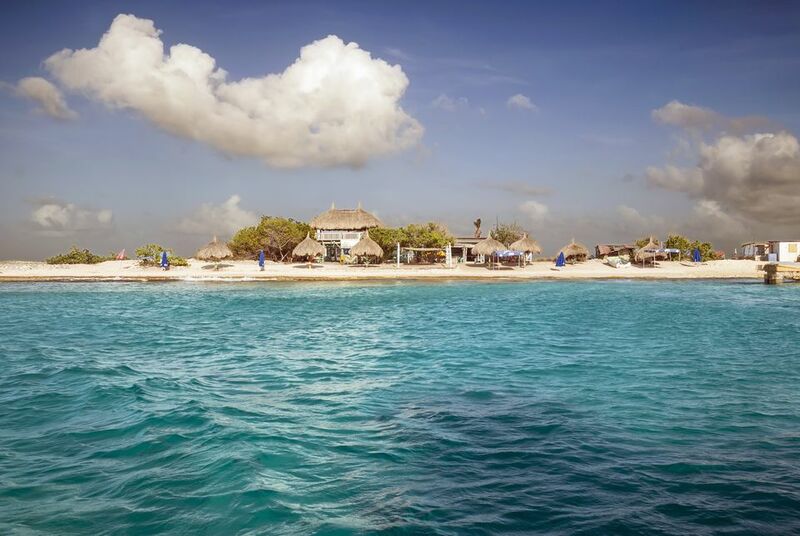 Curaçao’s longest beach is on Klein Curaçao, a tiny uninhabited island eight miles off the southeast coast of the main island. Dive operators and charter boats like Mermaid Boat Trips and Miss Ann take passengers out to this oversized volcanic rock for beach parties, cookouts, swimming with turtles, and fantastic diving through coral caves. The island's photogenic lighthouse is a local landmark. Located near the village of Sint Michiel, just to the northwest of Willemstad, Blue Bay Beach has soft white sand, a water sports center, a bar and restaurant, and a play area for children. The amenities and turquoise waters make this a favorite for both locals and tourists. The Blue Bay Resort on the beach has an 18-hole golf course and luxury villas and apartments steps from the water. Located right next to Curaçao’s Sea Aquarium, this beach has several shops, restaurants, bars, and water sports equipment rental kiosks, making it a perfect option for families during the day. After sunset, the beach transforms into a popular nightlife scene with music and dancing at bars such as Mambo, Cabana, and Wet & Wild. Concerts and movie nights are also hosted at this beach. If you're looking for a place to stay, pick the Lion's Dive Beach Resort, which is right on the sand.